She looks way better in my jewelry than I do. Usually Minnesota Augusts are hot, sticky, and in general one of my least favorite months of the year. It's the month I spend thinking about how glad I'll be when it's September - see here for proof. It's the month when my plants take a big nose dive - looking dry, faded, and gangly, and the grass is usually a sad shade of brown for lack of rain. This August however is quite a deviation from Augusts of the past. We have had rain, rain, rain. It looks more like spring around here. I took a couple more pictures of the outside to show how the flowers have been doing. I'm quite pleased by their color, and have to say that as a result of this mild weather I'm actually enjoying August (even though I'm still thinking about autumn - as exemplified by the picture at the bottom of this post - I can't help it). I also took a few pictures of the kitchen because I enjoy the lighting during the middle of the day. I'm sitting at the island right now as I write this post. Seems to be one of my favorite places to sit - whether I'm on the computer, reading, looking at magazines, eating - I just like it here. These are some roses I picked up the other day and liked how they started to look droopy and sort of hang dog. I like the creamy pitcher paired with the creamy roses. This is my little shelf of Ironstone pitchers - something I tend to look for when I'm antiquing. I like seeing similar things all grouped together. And, as I mentioned, despite being very satisfied with the pleasant, mild August weather we've been having I still get excited about autumn. As I've mentioned in the past, I drag out all my fall and Halloween stuff on September 1st. Yes, it's true, in August I'm dreaming about the October gatherings we'll have, cups of cocoa, warm sweaters, jeans, boots, picking pumpkins and apples, and of course going antiquing - all good stuff. Be well my friends. Just got back from North Dakota again - sadly there were no fun antiques accompanying me home with this trip. Evy and I drove out to my grandpa's for a family reunion - lordy that was a long drive - took me 9 hours. I was so tired on the way out there and had to make numerous stops to wake myself up. According to my meticulously planned calculations I should have been in a chemically induced state of insomnia. That was definitely not the case. The coffee, two Rock Stars, and two "5 Hour Energy" shots I consumed during the drive really had a poor showing - very disappointing. Falling down on the job they were. I really kicked it up a notch on the way back though - made it in 8.5 hours. I know. Driving and sleepiness aside, the reunion was fun and we had a really good time visiting my family, hanging out at the family farm, and playing Cribbage and Rummy. Wanted to share a few pictures of the back yard - and one random vignette picture from the Family Room. Also, just got my Moo cards - they are so fun and cute. Oh and I'm totally loving the picture editing site Picnik. Not sure if others have used it through Flickr, but it's pretty fun. Anyone see a lurking gnome? A rose from my back yard - I have no idea what kind. I'm sure someone looking at this knows what it is. Mostly I just think it's pretty, but it would be nice to know its name. I'm sure it looks like this path goes some where, but it doesn't. I like that it looks like it has a destination - it really should lead to something fun. Some day maybe it will. For now it just sort of meanders its way to the back of the property. I planted a peony bush last year and was so excited this summer when it produced a number of beautiful blooms. Just love those peonies. 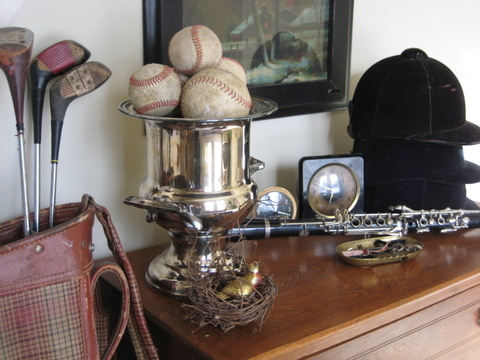 And, like I said, a random picture of a little vignette in our Family Room. The post cards, pictures, and receipts are all over 100 years old. They all relate to my great grandma and grandpa in some way. A receipt for material and for music school, tickets to a play in Minneapolis, pictures of my great grandma, and post cards written to her or by her. I love that I have these little bits from their lives. Just every day things they touched and used. I hope you all are well and having a good week. Can't wait for the new "Psych" and "Monk" on Friday. My cousin Kelly on the left, my Aunt Claire, me, and my mom - Lynn on her birthday. Silver collection in the kitchen. Family room view from the kitchen - the living room is on the other side. My trip to the farmers market - needed rhubarb for the crisp! I ended up using rhubarb, blackberries, raspberries, blueberries, and strawberries - it was a really great combination. 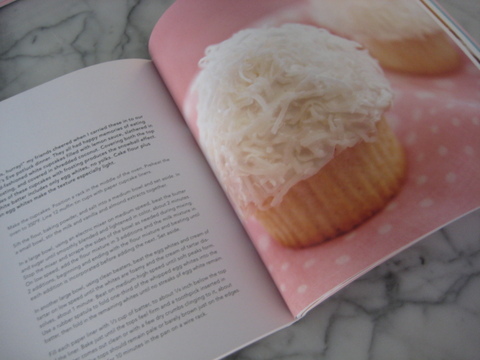 If you have "The Farm Chicks in the Kitchen" cookbook the recipe is on p 112. It's called "Blackberry Crisp", but you really can use any combination of berries and fruit that you like. I've included the recipe below for anyone who needs it. · Cut the butter into the flour mixture with a pastry cutter or your clean fingers until the mixture forms large crumbs. Happy Birthday to my mom, who just turned 60 on July 7th. We were able to be together to celebrate her special day. I love you mom!! Mom loaded her car with all of the treasures that I couldn't bring back with me on the plane in June. I'm very excited about my new chair (also pictured here), which made it's way from Washington to Idaho, Idaho to North Dakota, and finally, North Dakota to Minnesota. It's now in the entry of my house - making me smile every time I see it. I love it and am so glad that I got it from JuneBug at The Farm Chicks show in June. And once again, the bag that I got at the JuneBug booth is also in the picture. I love it so! Just brought these flowers home from the farmer's market this morning. I enjoy arranging flowers in a no frills, relaxed sort of way. Nothing too fancy. There's my big boy - K.C., laying next to my new pillow (which also made the trek in my mom's car with many other treasures). It's a wonderful heavy linen ticking. I have to say, I hate polishing silver, but it sure looks nice when it's done. A growing collection of starfish and my new "Cottages on the Coast" book that Steven got for me. I hope you're all having a nice weekend. We are grilling tonight and I'll be making some strawberry rhubarb crisp for dessert. It's so good and will hopefully be picture-worthy so that I can share it with you. I wish I had some inspiring 4th of July-related decorations to share with you, but I have not but one. Seems like a decorating dilemma for me doesn't it. An untapped decorating opportunity one might even say. The above is a platter in my foyer on a chest of drawers. I love that little nest - it's from Junebug Furniture & Designs. This is a great urn that I found at Haupt Antiek Market in May. I added a picture of my grandma Lillian in uniform. I got this great burlap bag from Junebug Furniture & Design at The Farm Chicks. It's lined and is so cute! i love the ruffles. My very cluttered looking vanity. A few favorites all in one place. I love these books, if not for their content, then most certainly for their appearance. I can't help judge these books by their covers :o) The content is good too...but again, it's kind of about the covers. I got this box of matches from Queen of Tarte. 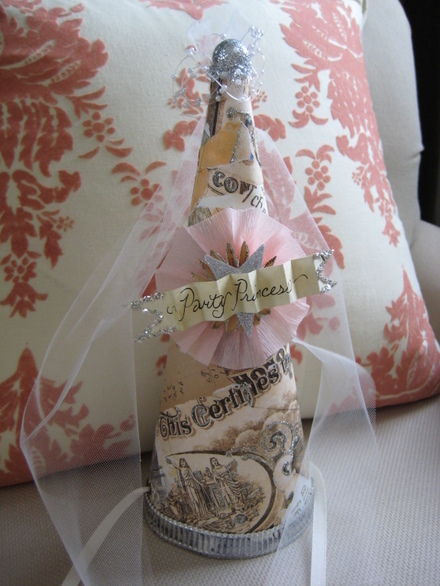 It's so cute and is simply wrapped with pretty paper, and painted on the bottom and sides with silver paint. 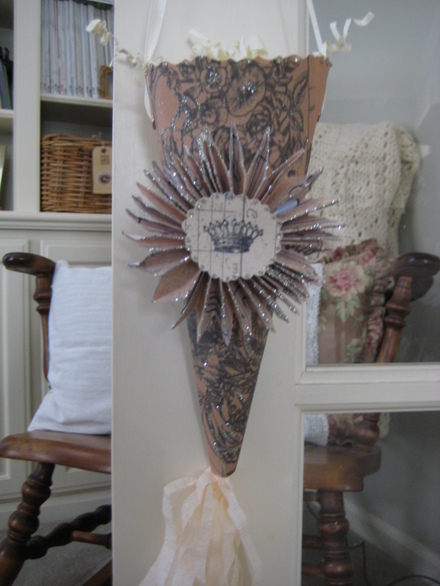 I liked the way it looked with my silver and rhinestone collection in a mercury votive holder. The reading/TV watching nook in our bedroom. One of the fun books Steven got me for Mother's Day. "Charmed Bracelets" by Tracey Zabar. I do love books! Especially if it has to do with decorating, mysteries, or both. There are more pictures, but I realize I'm being a bit overzealous ;o) Happy 4th!!! When things are so busy it really is nice just to have a day at home. I enjoy not having to be anywhere, mixed in with some relaxation as well as getting things done. Raspberry Chocolate candle from Stephen's Candlrey in Hayden Lake, ID (just down the street from my mom). My favorite candles that they have are the Pumpkin and the Candy Corn (seasonal). Both are outstanding. One of my new pillows from The Farm Chicks sits in the Family Room. I should have done a close up of it - has a great faded French looking pattern. 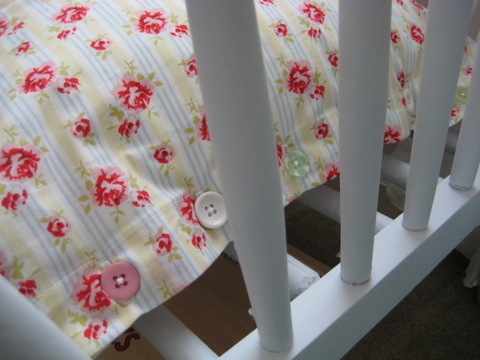 The fabric is from Shabby Chic. I really enjoy dog figurines made in Occupied Japan. I have quite a few now and still don't tire of looking for them. I also have a couple of dog show trophies and ribbon. This old wire filing basket work great for corralling magazines. I've had this old tray for a couple of years now. I use it in so many different ways - for now it holds books that I often look at while sitting on the couch. These are all finds from my trip to my mom's. All but the "A" are from The Farm Chicks show - the "A" is from a little antique store in Coeur d' Alene, ID called Forget-Me-Not. I have more pictures, but I'll post those in my next entry. Hello my friends. I hope you are all doing well! At the end of September Steven, Evy, and I traveled to London for vacation. As some of you know, I have a bit of an obsession with all things English - so I felt completely in my element whilst holidaying there ;o) I even got to meet the beautiful, sweet, and funny Sophie from Sophie Honeysuckle. Meeting Sophie really was a dream come true for me - we had such a great time. My only complaint is that I wish we could have gotten to spend more time together. We had an excellent time at Cath Kidston, Cabbages & Roses, having coffee, doing some clothes shopping, and above all - getting a chance to talk face to face. What an excellent way to spend a day in London. Below is a picture of Steve, Evy, and me at Stonehenge. Here we are in Bath - it was so beautiful there - and so very commercial. It was a strange combination of the very old and well preserved buildings, churches, and cobblestone streets, paired with oddities like the Disney store, and Starbucks. True story. Little Evy turned 5 while we were in London. We had so much fun that day. We went to Hamley's Toy Store where she picked out the Paddington Bear and pink kitty with her birthday money. We had brought the Emily American Girl doll with us to give to her (the Emily character is from England and went to stay with Molly in America during WWII). We thought it would be fun to give her a doll who was from England. She was ecstatic and likes to tell people that Emily is from England. By the way, we have and American Girl store that is opening right by us at the Mall of America on Friday so we are pretty excited. I will post more pictures of England - I just realized my picture of Sophie is on our other computer so I need to pull it off of there (as well as my pictures in Cath Kidston). I'll also take a picture of the fun spotted green bags that both Sophie and I got at CK. Talk to you shortly my friends. Portland was very nice even if I was there for work. I stayed in a great old hotel, The Benson, and was able to get out and shop a little one night. Anybody heard of Powell's Bookstore? It's ginormous! I spent some time roaming the isles and purchased several books and magazines for myself and Evy. I also did a bit of clothes shopping which is always a good time. I got home on Wednesday and am leaving again tomorrow for another work trip - this time for St. Louis. Today Evy and I had an outing at the mall where we bought sparkly shoes (for Evy, but sadly not for me), and some fun clothes for the two of us. I don't shop for clothes very much so it's fun when I do. My favorite store is J.Crew (very often I realize that literally everything I am wearing (save for underthings) is from J.Crew. - this includes my coat and scarf). I do love that store. 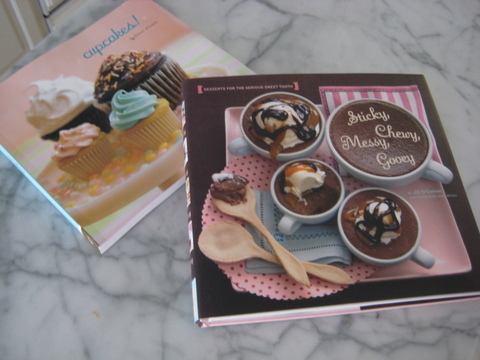 Anyhoo, I recently received a wonderful, and completely indulgent cookbook as a belated birthday present from my friend Boni, and at about the same time I purchased another cookbook - nearly as equally indulgent - just because it looked so good - "Sticky, Chewy, Messy, Gooey" and "Cupcakes!" respectively. Both have great covers, pictures, and recipes. "Sticky, et al" is by Jill O'Connor, photographs by Keigh Beisch. "Cupcakes!" is by Elinor Klivans, photographs by France Ruffenach. I wouldn't normally add who did the photographs, but they both do such a fantastic job that I had to mention them. 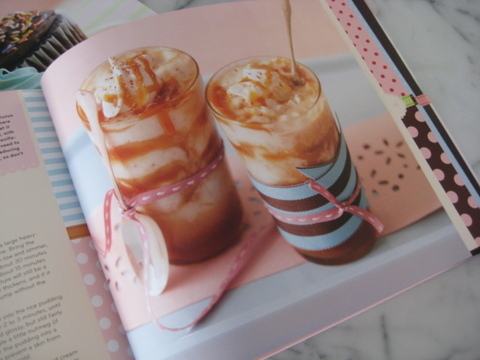 This is a picture from "Sticky, Chewy, Messy, Gooey" as is the below picture. A bit blurred, but you get the idea. Those colors, the arrangement of the food...it's all so great. 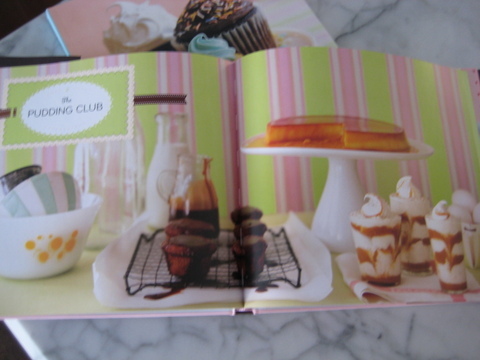 This delightful photograph is from "Cupcakes!" I recently updated the display atop the little chest of drawers in our entry. 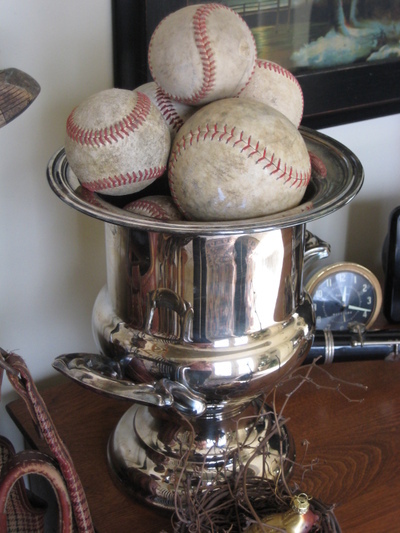 I love old baseballs and like how they look in a silver champagne bucket. If my friend Susan reads this she may recognize it as a wedding gift from her in-laws, which has yet to be used for chilling any sort of beverage in the 10 years we've had it. It's been used for practically everything else though. Also pictured is the new (old) clarinet that I recently got from an antiques store called Hunt and Gather in Minneapolis. I think it's the combination of a classy, respectable looking champagne chiller filled with very old, beat up baseballs that appeals to me. I don't like things to be too much of anything - it's the mixing and matching of old and new, glitziness and restrained elegance that gets me excited. And since it's almost Valentine's Day I am including a picture of the little hand-stitched heart that I made last February. 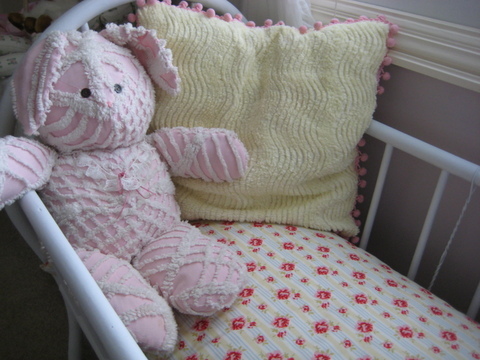 It's hanging in the Living Room right now, but normally resides in Evy's room. 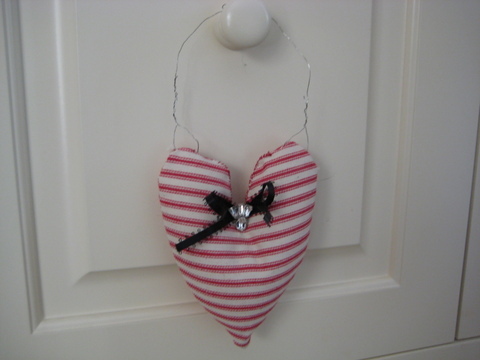 Some of you who have been reading for awhile may remember when I made this humble little heart last year. Thanks to everyone who drops by even when I'm not so quick to update my blog. I really do appreciate your comments and emails. Thank you for always being so supportive, kind, and funny. Talk to you when I return from St. Louis. I've had a number of pictures to post lately, none of which seem to relate much to one another. I guess there doesn't need to be a theme exactly, it's just nice when there is one...says me. Odds and ends, mixed with a bit of this and that are okay too. 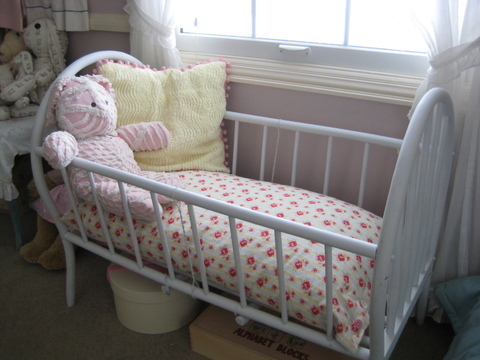 When my mom was here she and I fixed up an old crib that had been used by my great grandma for her six baby girls. It stayed in our family and was used by my mom for her dolls when she was growing up. I painted it and my mom made a nice cushion for the bottom of it. Evy's babies have a new place to take a nap now. My mom sewed different colored buttons on the end of the cushion for the enclosure. 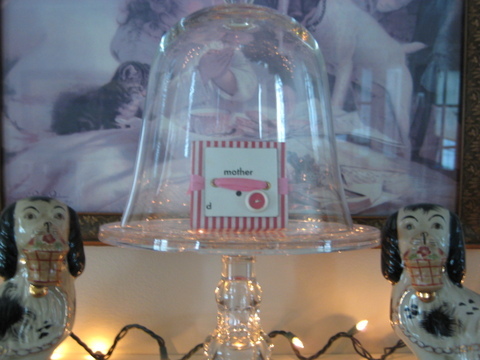 I got this little "mother" box at Hunt and Gather in Minneapolis, MN. It's been featured in Country Living and is just 20 minutes from my home. I also got an old clarinet there as well and have it next to my old trumpet. And now for the important stuff. I purchased several goodies from Rosemary who makes fantastic creations - the kind of wonderful goodies that just make you smile. This is one of the cones that I got from her. She sent me two because she wasn't sure which color I would like better. I love them both! 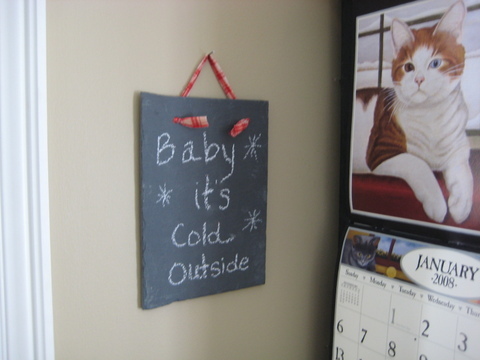 This one hangs on the french doors between the living room and the family room. 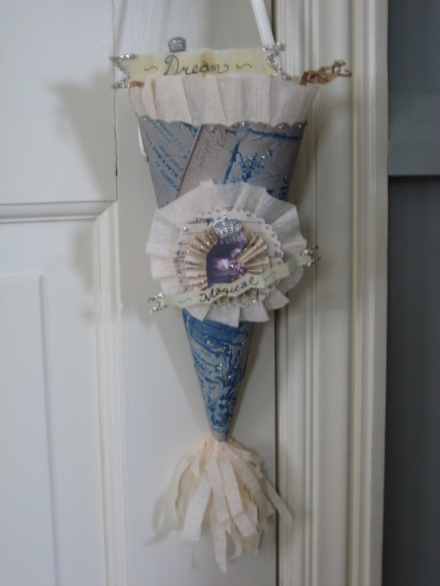 This is the second cone, which works perfectly in my bedroom. It actually hangs from my nightstand, but the lighting wasn't as good there so I moved it to the door. I also got the little "Dream" banner that is set in the top of the cone. For some reason my camera wouldn't quite focus in on the little box, but I'm sure you can still see how lovely it is. 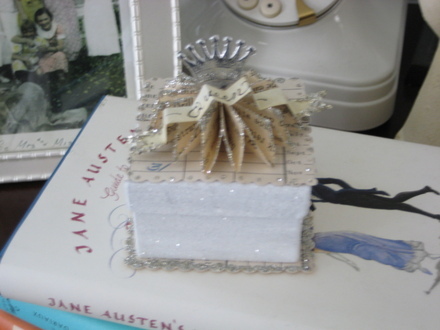 It sits on my night stand atop "Jane Austen's Guide to Good Manners; Compliments, Charades & Horrible Blunders"
And this...this is the wonderful crown that Rosemary made. I just love it! I love it all and am so glad to have her beautiful creations in my home. She is so detailed and uses such pretty materials. Thank you Rosemary for allowing me to purchase these lovely works of art! I've recently received a couple tags and an award. I will write about those in my next post along with some photos from my mystery bookshelf which recently received some Nancy Drew additions thanks to my very sweet and thoughtful husband. I hope you all are well my friends.